Push notifications have become very popular among brands that use them to communicate with users, as they increase customer engagement and retention. But do they benefit the e-commerce sector? How do they influence the traffic and revenue of online shops? Take a look at the results of a 9-month research in which we monitored the effects of push notifications sent by one of our clients – an authorized Under Armour sportswear retailer. Today’s average smartphone user has 26 mobile applications installed. Every now and then, they delete the ones they don’t use. This common practice, however, it is a major concern for every online shop owner. So what can be done to prevent users from getting rid of your app? Push notifications are an effective option. Users receive these messages directly on their devices, even if they aren’t using the app at that moment. motivate users to take action and buy the products. The impact of these notifications on traffic and revenue was analysed by General Sport, which uses their app called U-Acko.cz to sell Under Armour sports apparel and accessories. From January to October 2016, it sent out 30 push notifications, each time drastically improving user engagement. According to the statistics, user interaction rose by 100% on the days when notifications were sent out. The image below shows traffic during the monitored period and the increases in app use on the days the push notifications went out (the peaks in the chart). If a user receives a push notification and taps on it, the system rates this activity as a direct open. The m-commerce app was opened by tapping the received push notification by 61% of users (direct open). 34% of users opened it directly from the home screen of their phones and 5% did so through the message history in the application (both are considered to be an influenced open). Push notifications contain various messages and can let users know about special discounts in the online shop, new branches, or limited-time offers such as “Free shipping today”. Besides providing quick, useful information, they offer users another advantage: instant purchasing with a single tap. 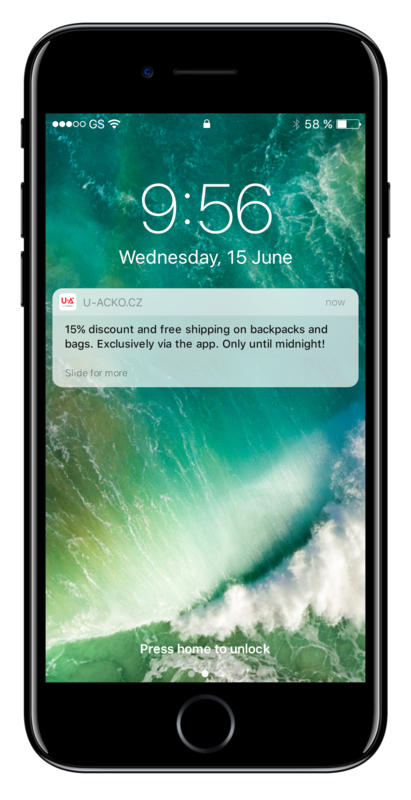 These days, a growing number of online shops are recognizing the potential of push notifications as an efficient tool to increase mobile revenue, just like U-Acko.cz has. The online shop’s well-designed offers and calls to action in the notifications motivate their customers to buy products. To what extent,though? Most of the peaks in the revenue reflected a push notification campaign. App-generated revenue grew by 125% on the days when push notifications were sent. Push notifications may considerably improve user engagement and mobile conversion, but there’s a trade-off. They may also trigger an uninstall, too. According to the general statistics, 78% of users turn off push notifications or directly delete the mobile application if they aren’t satisfied with the messages received. We don’t think about the number of uninstalled apps; push notifications are something new and original, and such things require some experimenting, which has paid off for us so far. The uninstall rate remained low throughout the entire period of the study. The e-commerce mobile application wasn’t uninstalled in any massive waves that correspond with a push notification campaign. Influenced by the push notifications, the rate at which users uninstalled the app dropped. Looking at the content of the push notifications and measuring their performance, we can see that it was the push notifications with limited-time discount offers that contributed the most to U-Acko.cz. On average, the notifications promoting a discount or any other benefit (sale, free shipping) generated twice as much revenue as those without. The most impressive numbers came from discount notifications such as Happy Hour/s that told users about time sensitive offers (“between 6 and 7 pm”, “till midnight”, etc.). U-Acko.cz wanted to avoid the time when the target group was busy or asleep (before 9 am and after 11 pm). So most notifications were received by users in the afternoon. Specific offers (“Free shipping till Sunday”, “30% off on everything”, etc.) boosted engagement and revenue than more general ones (“New products from our spring/summer collection”). The target page of the push notifications always corresponded with the content of the message in order to simplify the path to the purchase (e.g. notifications promoting a discount for a category of women’s shoes led directly to this particular category). On average, the online shop sent out 3–4 push notifications per month. Asymbo is an app development studio that specializes in creating customized m-commerce solutions for iOS and Android platforms. For the purposes of this study, it processed and analyzed the results of 30 push notification campaigns conducted by U-Acko.cz between January and October 2016. It mainly analyzed their impact on uninstall rate, traffic, and revenue. Karel’s main strength is that he leads by example, he has a knack at bringing the team together and pointing them in the right direction. He’s also a pragmatic strategist and an intuitive marketer. 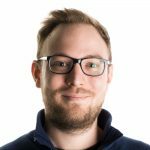 He has a very clear vision on how mobile apps are beneficial to retailers to improve their service and increase profits.